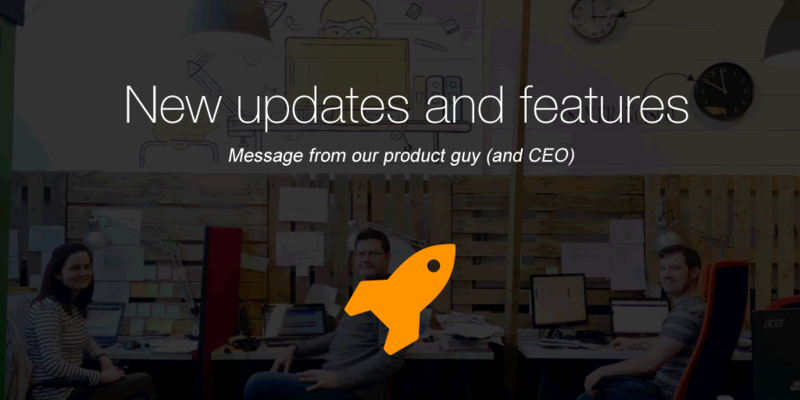 A quick heads-up on some great features and updates coming to OnePageCRM this week. 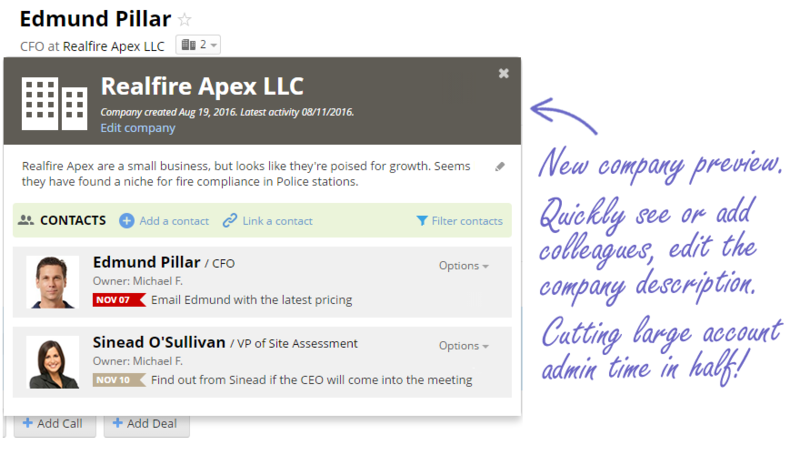 Our beta testers find the latest updates really speed up adding/editing contacts and companies. Thanks to your feedback we can constantly innovate, and we’re really excited about the future of our app. Note: If you’re an account administrator or the CRM champion in your company, please take some time to communicate the updates in your team. We’re holding a specialist webinar to introduce these great new features. You can register here. After a long wait (some might say) this is one great addition. 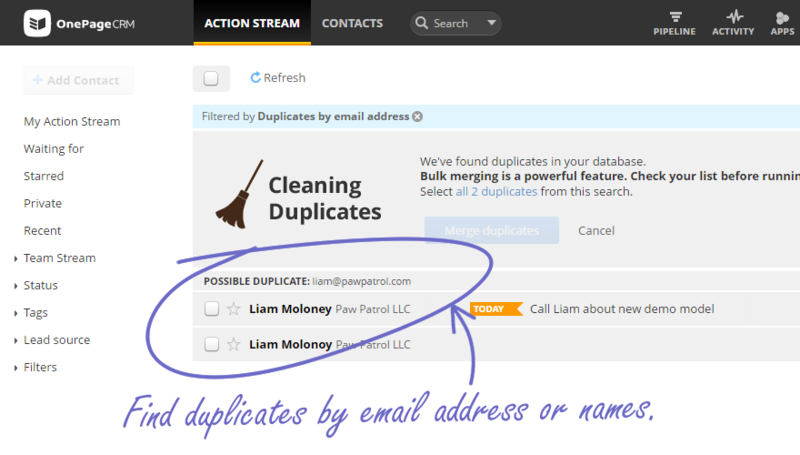 You can now find and merge duplicates in bulk which will to keep your database in ship shape. You’ll find this filter in our Advanced Search popup. Over time, our app has got more powerful and some settings and options were not as clear as they could be. In response we’ve simplified the entire settings area, keeping it visual and more intuitive for all users. There’s also some new preferences, like automatically showing colleagues activity and custom fields expanded by default. This was a big one for me. In the past we had a lots of users asking for Company-wide custom fields and a separate description for the company, not just a contact. We added this functionality during the summer, but it wasn’t our finest hour in execution. We temporarily lost our vision of keeping the usage of a CRM close to the usage of an email client, where there’s really only two main aspects aspects… a list and a view. Removing the “contact/company switcher” button and replaced it with a much quicker company preview from within the contact. Keeping you in the principle of single context that “the one page” application was founded on. 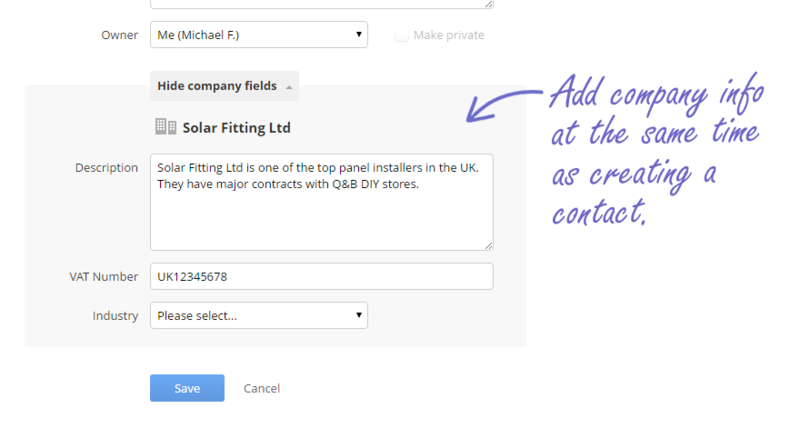 Allowing you to see company-wide custom fields within the contact. We’re actually a little embarrassed about this part too. While “the company info” was important to you, we made you jump through hoops to add it! Now you can create the contact and the company at the same time, same screen, same save button. So now the process is Add Contact and Company > Set Next Action > Pow! 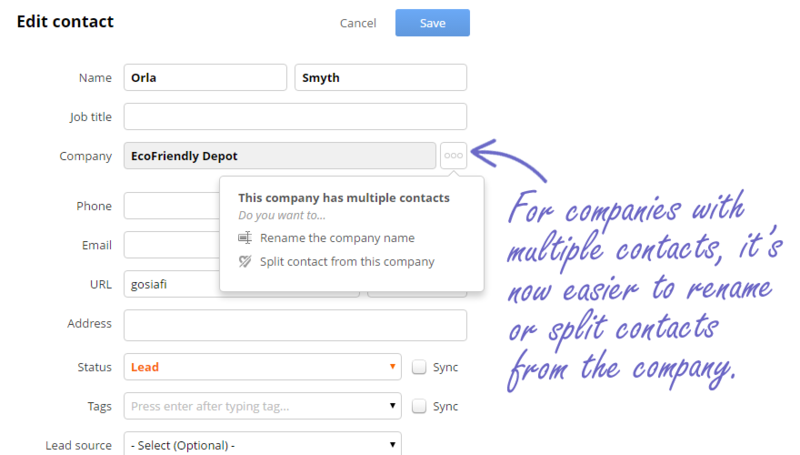 We’ve also made it super easy to handle companies with multiple contacts for when you want to split (remove) a contact from the company or rename the company. See below. At this stage, I want to also give you a heads up on some other imminent releases. Good news for legacy users of OnePageCRM who are still using our 2-column interface. All the latest updates to our app will be coming to the 2-column interface over the coming weeks. Infinite scroll in your Action Stream option for all users. Send emails and save templates from within OnePageCRM (Starting with Gmail users). Thank you for your continued support and valued feedback, all this helps us build a stronger product. That all looks great but my version doesn’t seem to reflect that? I’m still getting the same layout/view. AAAH! sorry! Ignore! Just realised that this is coming this week – misread it and thought it had already rolled out. Thanks for commenting Caroline, the full changes should be out later this week. Brian. PS. I did talk to someone at OnePage about this, but it would be BRILLIANT for us if the system integrated with Dymo printers – we print address labels for orders/letters etc etc all the time and now can’t do it. Thanks. I can see that you suggested the Dymo printers integration last month – thanks again for that. If it’s something we follow up on at a later date, I’ve a note taken to reach out to you. We appreciate all your feedback, and if you need any more assistance, please let me know. When we create a custom field it does not alphabetize the list. This really, really needs to be updated. This is crazy. Hi Monty, thanks for your feedback. The Merge duplicates feedback will quickly identify and merge any duplicated contacts created using Zapier as well. But it will not prevent Zapier from creating them. 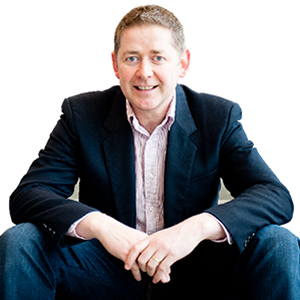 Let me know if you’re having any issues with this brianm@onepagecrm.com. When you select ‘Split contact’ it will separate the contact from the company they are a part of and move them as an individual (or join/create another company within your account). Hope this helps. 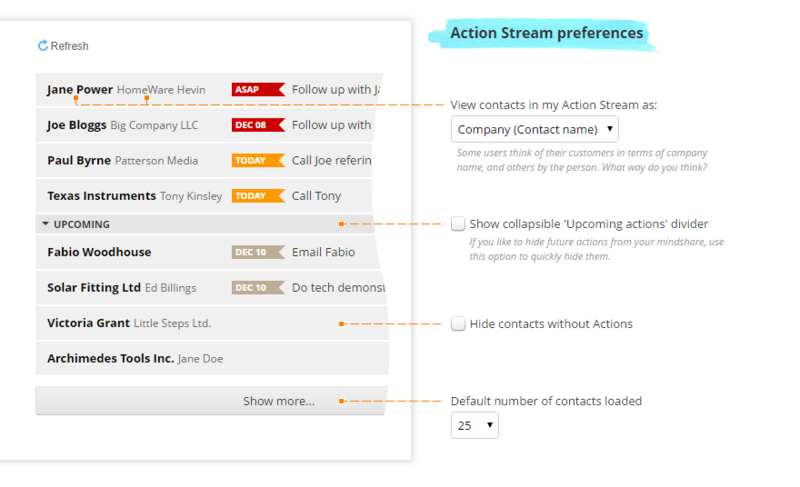 Can’t wait to send mails from my CRM, that is a feature I really like because it will save me time switching tabs. Glad to hear it Jasper, keep an eye on our blog and we’ll be announcing this in the near future. When you say we can send emails from onepage – do you mean we will have an “inbox” set within the CRM? … fingers crossed! Hi Dave, once this is released, you can connect your Gmail/Google Apps inbox (for starters) and send from there but all while working inside OnePageCRM. We will be announcing more once it’s tested and closer to release. Thanks, Brian. Thanks for your feedback Ron. It’s a fair point and one we’re looking into at the moment re: address and photos. Hopefully we’ll get around to reviewing your other points as well in the near future. Thanks again, Brian. Now that our CRM is getting rather busy with a continually growing number of contacts it will be great to do a clean up of duplicates in bulk. Feeling very exited about the email direct from CRM. We are loving the app updates as well as we are on the road a lot.